Genevieve Kalt is like many of us. We love using our skills to create things for friends and family. A few years ago, Genevieve decided to turn her hobby into a business and created Kits by Kalt. In our interview we learned that not only is she a talented ornament pattern designer, she is also an avid paddle-boarder and dog lover. QW.com: How did you get started in designing your ornament patterns? KBK: I first learned how to do this method at a class. 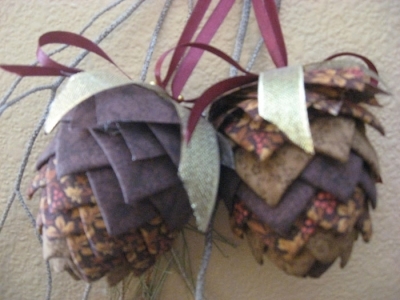 I used to make them as gifts for everyone I met, I branched out and started making the pinecones and trees just for a change of pace. I made them as gifts for over 10 years with all of my friends and family telling me that I should sell them. I knew that selling the finished product was never going to be lucrative. It wasn’t until I had a few weeks off between jobs that I made about 100 kits and took them to local stores to see if they would even sell, that was in June 2010 and it has been growing ever since. QW.com: Your sister is part of your design team? What roles do you play? What is it like working with family? KBK: My sister and I have been crafting since we were little. She was a Girl Scout and I was a Campfire girl so we would always share the latest projects and crafts that we were working on and learning. I learned how to do Counted Cross Stitch when I was 9 years old, and taught her how, and we both still really enjoy cross stitch. She has been one of my biggest supporters. She helps with Social Media, but mostly with distribution and shipping. Because it is on such a part time basis, it really works well for us both. 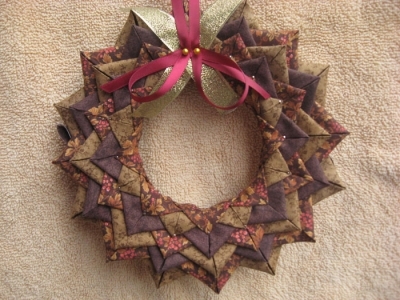 KBK: The best selling patterns have been the Pinecone and the Starry Night wreath. They have run neck and neck for the last 3 years. 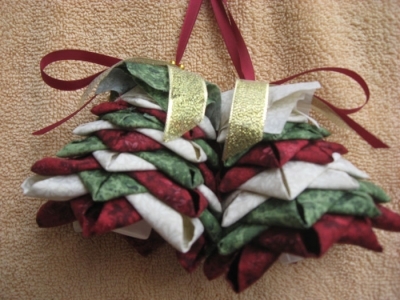 QW.com: How do you decide what fabrics to use when doing prototypes for ornament patterns? KBK: I love picking out fabrics. I used to quilt a lot, I made baby quilts for all 7 of my nieces and nephews. I try to stick with somewhat traditional fabrics , but I have just used scraps if that is all I had at the time and was inspired. QW.com: A lot of our readers tell us that they have trouble finding more time to craft, quilt and sew. What advice would you give them? KBK: I really have a hard time quilting and crafting for myself (for fun) now that it is a business. Most of my creative energy gets taken up by new designs and prototypes. I do find that on Sundays when I have the football games on in the background, I can snuggle on the couch and cross stitch. KBK: Aside from quilting and crafting, I spend a lot of time doing Stand Up Paddle Boarding, usually in the ocean, I surf the waves on my board. I usually am in the ocean at least 4 days a week. I also dabble in gardening, and I have an awesome Labrador that I rescued 3 years ago. Thanks for reading our interview! This entry was posted in Designers, Gift idea, patterns, QuiltWoman and tagged Genevieve Kalt, Kits by Kalt, QuiltWoman.com. Bookmark the permalink.